To generations of the Spiker family, the front porch has always been the spirit and soul of the homestead. Flanking two sides of the house, it was impressive enough to accommodate the largest of gatherings yet humble enough for the most intimate of conversations. Not just a framework for the door leading into the home, the porch also served as the framework for the door leading into the hearts, minds and lives of the Spiker family. Daily living was played out on this porch. Here, Jake greeted the morning sun with a stretch and a smile. After lunch, Gay penned words of encouragement to her children in a diary. Eager young men courted the Spiker sisters in the afternoon. And in the dark of night, Marjory stuffed lightning bugs into a Mason jar. Adventures were planned. Secrets were whispered. Celebrations were shared. Volumes of family history were recorded from this portal. Although most were not written down, they remain etched in the stone steps, stamped into the wooden floor planks, and carved under the sun-washed swing. Revisiting these memories is as simple as crossing the threshold. Welcome to the Farm and the Spiker Family Gathering Place. The PORCH is the entryway to our house. It serves as the site map for the Spiker Family Gathering Place, guiding you through the "rooms" of our home. Simply choose any "door" and walk right in. Finding your way around is easy. Want to read a good book? Head over to the Library and check out stories written by - or about - our family. Hungry? There's a cookbook in the Kitchen where you can find all sorts of yummy family recipes. Looking to just sit a spell in the Living Room? Great. Feel free to flip through some of our clippings, scrapbooks and photo albums to learn more about our family, our friends and our neighborhood. And if you want to get to know our ancestors, "climb" our family tree, or find fun activities to get the kids involved in genealogy, you'll want to take a stroll through our Garden. Then each time you return to our home, we suggest you first stop by the Newspaper Box to pick up the most recent edition of the Spiker Family Gazette. It's the way we keep our guests informed of the renovations and additions to our home between visits. 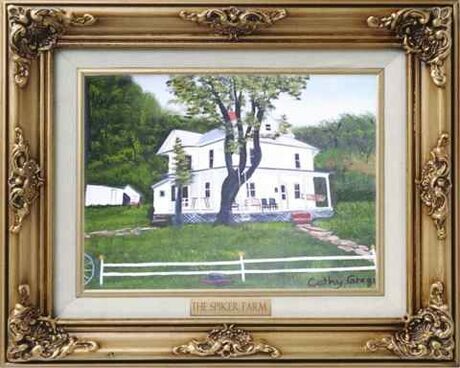 Oil on canvas painting by Cathy Spiker Gregis, 2006. Lost? Turned around? Not sure where you saw it before? Try our Search Box. If that doesn't work (it's moody,) try a "Google Site Search." Head over to Google and type in "site:spikerfamily.com" (w/o the quotes,) then enter the name or phrase you want to look up.